Lately the indie polish world has erupted with some serious drama that has left me feeling a bit unhappy and bummed out. 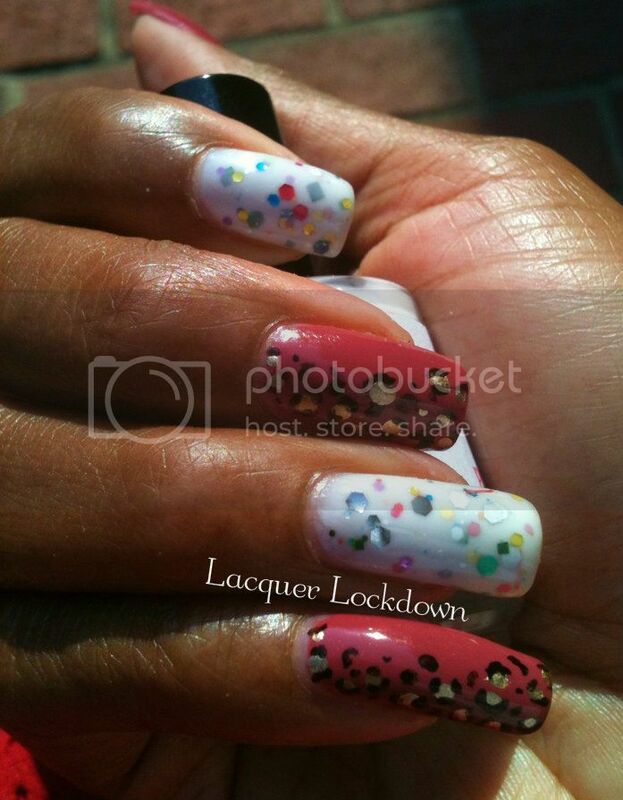 I'm a big supporter of these independent lacqueristas, but I can't stand drama at all. The first sign of trouble and I'm out! So I was feeling a bit down and wanted to create something playful, lighthearted, and easy to lift my spirits a bit. Enter leopard print and DDP's Bazinga! Bazinga! 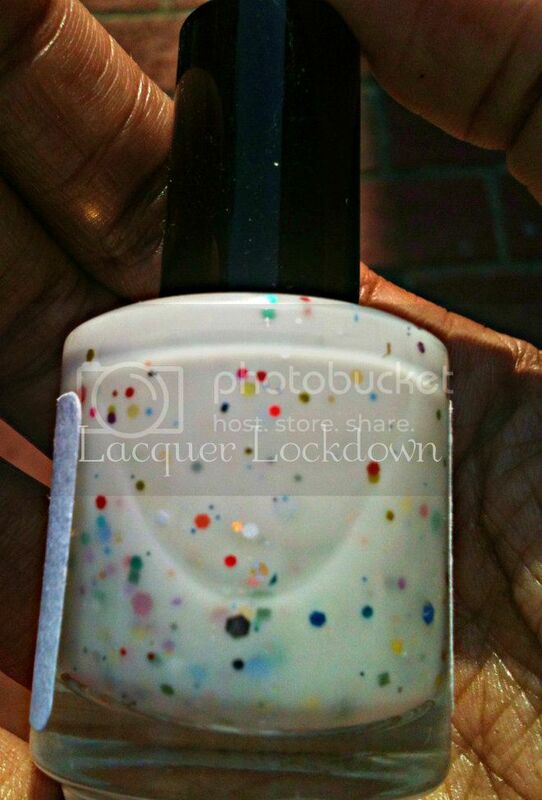 is a creamy white jelly polish loaded with multi-colored hexes small round and bar glitter. It is yummy and reminds me of candy, ice-cream, and all things sweet! I used Essie's Marshmellow, a squishy white jelly, as the base and then used three layers of Banzinga! to reach opacity. I probably could have done it in two but I wanted to make sure I didn't have any VNL like I did with my last mani. I used a more subdued color, Essie's In Stitches, for the base of my leopard print. It's a very rich deep colored rose creme polish that is opaque in 2 coats. 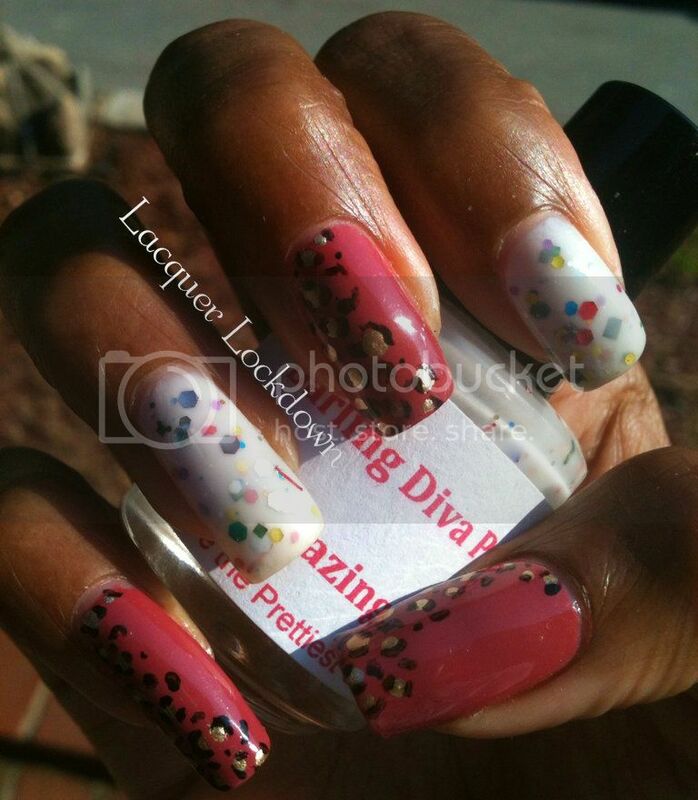 The leopard pattern was freehanded with China Glaze's Passion and Orly's Liquid Vinyl. Check out the final results below. See what I meant about the Banzinga! just being layers and layers of milk and sprinkles? I really love this effect of jelly finish polishes! Bottle shot of Bazinga! It looks like melted ice-cream with tons of sprinkles. Yum! This is a picture I took before I started adding the leopard print - indoor lighting. You can see how In Stitches adds a bit more somberness to the festive quality of Banzinga! I think the extra metallic quality of CG Passion that I used for the leopard spots really added a 3rd dimension to this manicure and really made the pattern pop. Quote on DDP labels: "The Prettiest Girls are the Happiest Girls. Be Happy! I love that! I really like how this turned out and can't stop looking through all the layers of Bazinga! to see the glitters underneath all the jelly base! 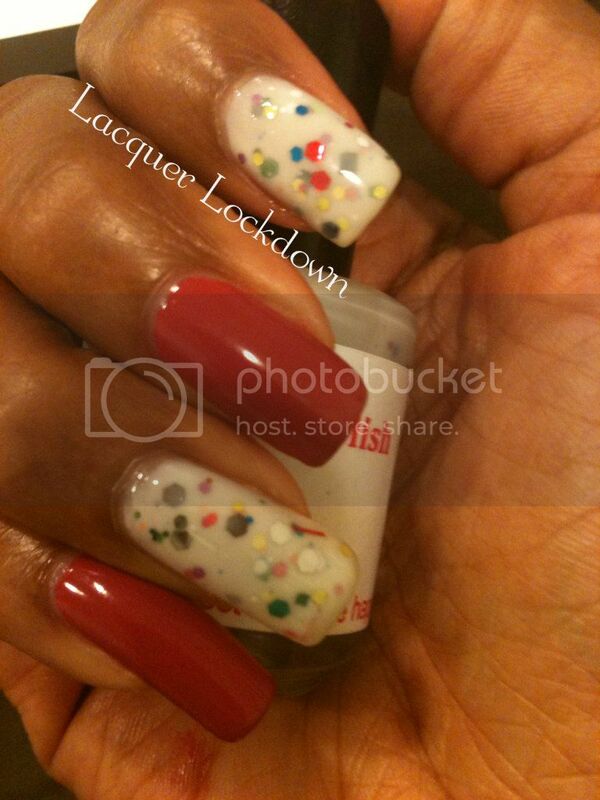 I think polishes like this are so fun and easy to wear. You just layer it up and it's instant art by itself. Also because Banzinga! is so packed full of glitter I didn't have to do any fishing at all just strategic placement of the glitters as I added layers. While I don't enjoy the drama behind the indie scene these days I will always be a fan of innovative and unique polishes, and I'm so glad I've had the opportunity to buy so many awesome polishes! If you're interested in Bazinga! 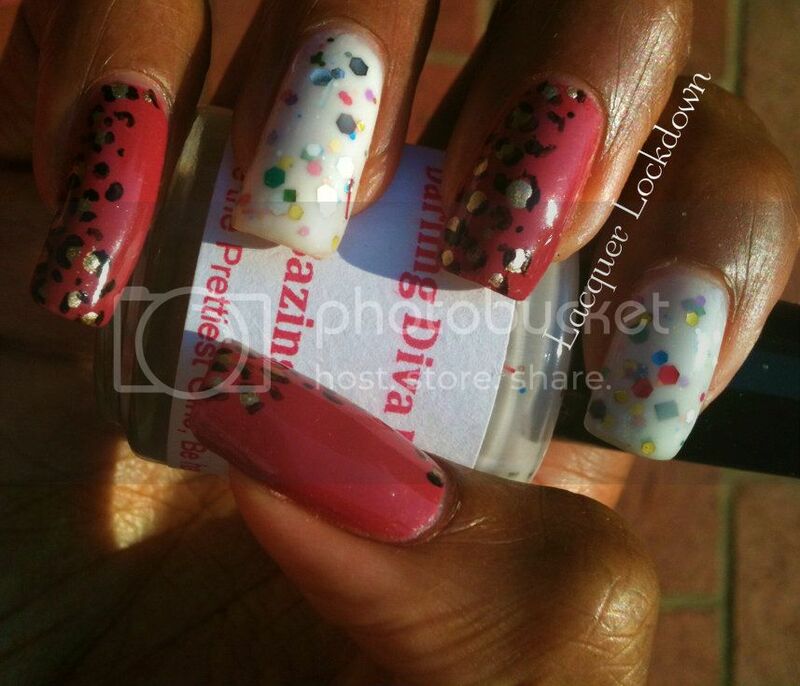 or want to see more Darling Diva Polish you can find her shop here on Etsy. The seller is super sweet, super responsive to emails, and always happy to set up custom listings. Theme Song of the Moment: Ruin by Cat Power. All about traveling, heading home, and complaining when you have lots and others have nothing. I like this song because a) it's utterly dancible, b) it makes me grateful for what I have and gratitude can keep you balanced when other things are falling apart and c) because it's Cat Power and she hasn't released an album since 2006's The Greatest. Thanks so much for reading and I'll see you next time. Toodles! Jump on it! Lol and then post it so I can see. I don't think I can get enough jelly polishes in my life because of all the glitter out there jellies are quickly becoming my most reached for polishes.